The Dojo Interior at Sakura Budokan reflects the spirit of its members. No doubt if you have come looking for traditional martial arts training the word Dojo is not foreign to you. It is the space that is reserved for martial arts training. The actual historical reference to the dojo actually precedes its use in a martial arts context. Originally and as it still exists today, the meditation and prayer hall of Buddhist acolytes was referred to as a dojo. It was the place where one went to study, practice and learn about the truth and nature of one’s existence. Do or michi, is the Japanese word for a road or pathway. Jo is the term used to denote a castle or great structure. Consequently the term Dojo denotes a place where someone goes to travel on a path to self-actualization, understanding ones true self. Anyone who is familiar with the eastern concepts understands that exploring ones desires and motivations is a key element to becoming self aware. This is a process of concerted effort coupled with deprivation and concentration. The traditional Japanese dojo, particularly those that espoused Zen aspects of simplicity, tended not to be elegantly adorned or frivolous. Such affectations were considered distractions to ones practice. The training hall was a place dedicated to the examination of one’s inner most inspirations, aspirations, desires and delusions. Fewer external distractions meant that the practitioner had only those things to examine that he or she had brought into the dojo with them. The sole purpose of the practice was to understand the things that they carried deep inside themselves. Throughout history warriors of all cultures have sought to improve on their abilities to resolve the fear of death and live with the physical and psychological scars of battle. It was natural that concerted training efforts and strengthening one’s mind held great appeal to the warrior class. The samurai often sought methods to steel their nerves and rationalize their thinking process. They recognized a great benefit in treating their everyday training regimen as a mental, physical and spiritual forging process much like the daily practice of the Buddhist monks. Even though the methods of practice were quite dissimilar, the quest for the truth that would free them from the fear of death was comparable. The bushi class understood that one who trained assiduously and religiously developed a mind and spirit that was not easily disturbed. Martial compounds and training halls were constructed within every daimyo’s prefecture for the training of the samurai. As these training facilities took on greater significance to the teachers and students they adopted the term Dojo from the Buddhist tradition. It became a place to study the path of budo, the warrior’s way. A traditional Japanese dojo is spartan. It should be free of distractions and extraneous materials. The training tools of the budoka should reflect their utilitarian purposes and serve their owners well. But they are not gaudy or perverse. The purpose of training is to focus on the practice over all else. Every member of the dojo is involved in the same activity and yet each individual is forced to experience something different. Even though all are dressed alike, move the same and share the same physical environment each experiences it in a dissimilar way. This is the true lesson of the dojo. That one’s experience is uniquely created within one’s own mind. Throughout our day we move about from one environment to another constantly collecting the experiences that shape the perceptions of our world. We are constantly distracted by the actions of others. Each new environment offers reasons for us to be affected in one way or another. Throughout the day we experience happiness, sadness, hunger, animosity, fear and all of the other human conditions that make for a good or bad day. The constantly changing environmental factors leave little opportunity for us to stop and consider the only common denominator in our entire day. The one string that holds all of those experiences together and gives them meaning. Us! For the budo-ka this dojo is a place that never changes, never distracts. It is place of consistency and leaves little to ones imagination other than what one takes in with them. The dojo is a microcosm for all other places in the budoka’s life. All of the distractions are eliminated so the only thing left to ponder is his perception, reaction and responses. Every member of the dojo sees his training differently even though the environment remains the same. If you squeeze a grape the result is a hand full of grape juice, and if you press on an orange hard enough the fluid that results is orange juice. When the pressure of training in a traditional dojo pushes the student beyond what he thinks he is capable of handling what is pressured to the surface for him to confront is whatever has been bottled up inside of him. He realizes that it is his perception of the experience that erupts to the surface. Why does he feel this way today and no one else in the dojo does? The exercise, critique and experience appear to be identical. These experiences force the dojo member to look deeply into his own mind and uncover the barriers that prevent him from living his highest life condition. They obstruct his true understanding of his potential and capabilities and they blind him of the perceptions and experiences of others. This is what real training uncovers. It is said that a good teacher of budo will take you to places you have never been before. But a great teacher of budo will change your perception of the place you’re in! 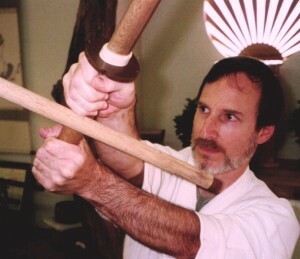 The traditional dojo is where you will develop excellent sword skills and it is a place where you will come to know yourself. These abilities are buried deeply within your potential and are yet to be manifested within your present world.